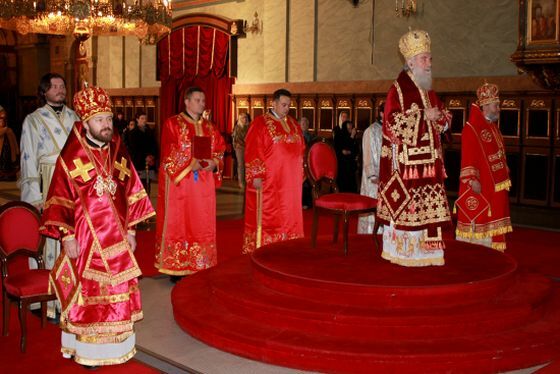 On 18 November 2012, Metropolitan Hilarion of Volokolamsk, chairman of the Moscow Patriarchate’s Department for External Church Relations, who was visiting Serbia with the blessing of His Holiness Patriarch Kirill of Moscow and All Russia, celebrated the Divine Liturgy at the Belgrade Patriarchal Cathedral of St Michael the Archangel. Officiating at the Divine Service was His Holiness Patriarch Irinej of Serbia. Concelebrating were also Bishop Antonije of Moravicí, representative of the Patriarch of Serbia to the Patriarch of Moscow and All Russia; archpriest Vitaly Tarasjev, dean of the Belgrade Representation of the Moscow Patriarchate; archpriest Igor Yakimchuk, DECR secretary for inter-Orthodox relations; and clerics of the Serbian Orthodox Church. Praying in the sanctuary was Bishop Andrej of Remesiana, vicar of the Serbian Patriarch. In his primatial word, the His Holiness Patriarch Irinej expressed his joy over celebrating the Liturgy with Metropolitan Hilarion of Volokolamsk. The hierarchs continued their meeting at the guest hall of the Serbian Patriarchate. That same day, the DECR chairman returned to Moscow. Metropolitan Hilarion was seen off at the Belgrade Nikola Tesla Airport by Bishop Antonije of Moravicí, Bishop Andrej of Remesiana, archpriest Vitaly Tarasjev, and Mr. Alexander Chepurin, Ambassador Extraordinary and Plenipotentiary of the Russian Federation to the Republic of Serbia.